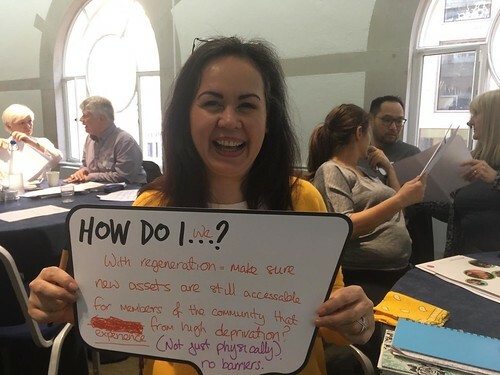 What happened when ten Big Local areas came to London to meet arts funders and practitioners at a discussion event co-hosted by Local Trust and the Calouste Gulbenkian Foundation? Last week, Michael Thawe spoke up. “Until this happened, I had never been to the theatre. I am a man of 50, from Welsh House Farm in Birmingham, and I had never been before. A group of us went to the REP. It was amazing. I loved it. I can’t believe I had never been.” He was speaking in the beautiful glass meeting hall of the Calouste Gulbenkian Foundation (CGF) in Hoxton Square, London, and he was talking to a gathering of arts leaders who fund and shape a good slice of the artistic and cultural life of England. Michael’s account of his experience attracted cheers from other Big Local residents in the room, who know very well that the majority of their neighbours rarely go to art galleries, theatres, orchestras or dance performances. Cara is presenting the experiences of Newington's community, which has placed art at the centre of their Big Local plan, because of what the community believes is its powerful impact on individuals and neighbourly relations. Newington is not the only Big Local area to discover the transformative effect of art. The range of arts activities underway in Big Local is phenomenal. It includes choirs, craft clubs, yarn bombers, community galleries, dance sessions and music making, and large-scale creative events such as carnivals and festivals. Involving people in art is widely recognised by funders as a powerful way to engage communities, develop talent, change reputations and increase the aspirations of local people. But it’s not limited to getting communities to see great art, dance or theatre. It's also about building sustainable local cultural facilities and activities, so that people can make and share their own art, and get creative in transforming their own local environment or tackle wider social issues. And it can also be about changing who makes decisions about art – whose voices and stories get to be heard on our main stages and arts venues – which is a hot topic right now. The Calouste Gulbenkian Foundation UK Branch is a funder committed to widening participating in the arts, especially from the most vulnerable and underserved communities. To help achieve this, CGF launched the Inquiry into the Civic Role of the Arts which aims to stimulate change. Big Local areas have an exciting part to play. In developing our submission to CGF’s Inquiry we uncovered huge enthusiasm for arts in many Big Local areas. We wanted to know more about what matters to Big Local communities engaging in the arts, and decided to co-host an event with CGF to explore the topic from a range of viewpoints, including those of Big Local residents. The Horniman Museum Studio Collective, which has a long tradition of community engagement and brings together community members, artists and curators to design exhibitions and creative events linked to the museum’s collection. Newington Big Local, who engaged People United to listen to the community and explore the creative ambitions of residents, resulting in the appointment of residents as Creative Champions, an annual BestFest creative festival and a film, The Best Of Us. Appetite Stoke, which is aiming to get more local people taking part in the decision-making process about making and producing art, and is making art playful and breaking down barriers through their community hub and a wide range of creative initiatives. The event was an interesting and important first step. One of the key points raised by communities was about the importance of putting communities in the lead of creative decision-making, and the importance of artists and arts organisations listening and understanding the experiences and aspirations of residents. That’s why the last word goes to Kate, an artist and resident from St Peters and the Moors Big Local in Cheltenham. Kate has been working with local families making artworks from clay taken from the gardens of the families involved. Through Big Local she’s also started to earn a living as an artist, and has connected to other artists in the area to form a community interest company to support more artistic activity locally. “You need to be there on a regular basis for people to learn to trust you, learn to engage with you. I didn’t want to say, ‘This is what you need’ because they’ve had that done to them all the time, and just don’t need it.